-Larissa FastHorse, co-owner; Ty Defoe, co-owner; and Jenny Marlowe, artistic associate; Indigenous Direction. New York, NY – The Global Theater Initiative (GTI), a partnership between Theatre Communications Group (TCG) and The Laboratory for Performance and Politics (The Lab) at Georgetown University, invites all theatres, individual artists, institutions, and audiences to celebrate the 58th annual World Theatre Day on March 27, 2019. 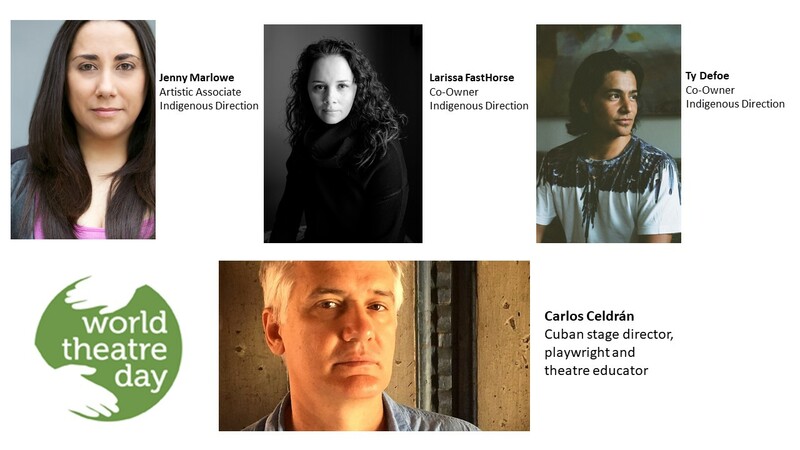 Additionally, as the home of the U.S. Center of the International Theatre Institute (ITI-U.S.), The Global Theatre Initiative is proud to announce the U.S. World Theatre Day message authored by Larissa FastHorse, Ty Defoe, and Jenny Marlowe of Indigenous Direction. . Past U.S. World Theatre Day messages have been given by Heather Raffo, Ping Chong, Jeffrey Wright, Lynn Nottage, Diane Rodriguez, and Kwame Kwei-Armah. Read all the World Theatre Day messages here:https://www.tcg.org/International/InternationalActivities/WorldTheatreDay/Message.aspx. Learn more about World Theatre Day and GTI’s international programming here. Carlos Celdrán is an award-winning and highly esteemed theatre director, playwright, academic and professor, living and working in Havana, Cuba and presenting his work all over the world. In 1996, he founded the now world-known and highly esteemed Argos Teatro. Based again in Havana, Cuba, Argos Teatro has won great fame with its renditions of European classics, contemporary Latin American plays, and original productions under Carlos Celdrán’s expert stewardship as stage director. The highpoint of the company’s existence to date was its production entitled Ten Million, a piece written and directed by Carlos Celdrán himself. This piece won critical acclaim, and was performed both in Cuba and internationally. Their most recent showing, Misterios y Pequeñas Piezas (Mysteries and Small Pieces) in 2018, also written and directed by Carlos Celdrán, has been likewise well received. Such endeavours for Cuba and international theatre have seen Carlos Celdrán recognised with awards and plaudits on countless occasions. He has won the Cuban Theatre Critics Award in the category of Best Staging on multiple occasions - receiving the award a remarkable 16 times from 1988 to 2018. Beyond this critical acclaim, he has also won the recognition of his country and the world, receiving the National Distinction of Cuban Culture in 2000 and the Cuba National Theatre Award in 2016, among many others. Indigenous Direction is a U.S.-based consulting company for organizations and artists who want to create accurate work about, for, and with Indigenous peoples. They are artists who use Indigenous cultural protocols and ways of looking at the world to guide theater and film making/writing. They facilitate equitable connections between clients and Indigenous communities and advise in program development to build bridges between organizations and Indigenous artists. As a team of Indigenous people who have been doing this work for years, they bring a sensitivity to different theatrical forms that have existed on this continent for centuries. They assist with research, tribal connections, and cultural training and offer artistic workshops open to Indigenous theater artists and their allies. The first World Theatre Day international message was written by Jean Cocteau in 1962. Succeeding honorees include Arthur Miller (1963), Ellen Stewart (1975), Vaclav Havel (1994), Ariane Mnouchkine (2005), Sultan bin Mohammad Al Qasimi (2007), Augusto Boal (2009), Dame Judi Dench (2010), Jessica A. Kaahwa (2011), John Malkovich (2012), Dario Fo (2013), Brett Bailey (2014), Krzysztof Warlikowski (2015), Isabelle Huppert (2017), and Heather Raffo (2018). The Global Theater Initiative (GTI) was launched in February 2016 by Theatre Communications Group and the Laboratory for Global Performance and Politics (the Lab), based in Washington, DC at Georgetown University. By combining the unique reach of TCG’s international programming with the Lab’s distinctive experience in humanizing global politics through the power of performance, GTI strengthens, nurtures, and promotes global citizenship and international collaboration in the U.S. professional and educational theatre field. It also honors and intersects with the work so many theatre colleagues have invested in cross-cultural exchange and understanding.Through the alignment of programming and resources, the GTI partners serve as a hub of global exchange with three core areas of focus: connecting practitioners with resources, knowledge, and partnerships to strengthen their work; promoting cultural collaboration as essential for international peace and mutual understanding; and innovating new strategies to maximize the global theatre field’s opportunities and impact. GTI also serves as the collaborative leadership of the U.S. Center of the International Theatre Institute (ITI/U.S.). International Theatre Institute (ITI) was formed in 1948, when the United Nations Educational, Scientific and Cultural Organization (UNESCO) joined with world-renowned theatre experts to form an international non-governmental organization in the field of the performing arts. The mission of ITI is to “promote international exchange of knowledge and practice in theatre arts in order to consolidate peace and friendship between peoples, to deepen mutual understanding and to increase creative cooperation between all people in the theatre arts.” Today, ITI consists of approximately 90 Centers worldwide. An ITI Center is made up of professionals active in the theatre life of a country and representative of all branches of the performing arts. For more information, visit www.iti-worldwide.org. The Laboratory for Global Performance and Politics harnesses the power of performance to humanize global politics. Since 2012, we have created and presented innovative, high-quality work from around the world that is at the intersection of politics and performance. The Lab's signature approach raises voices rarely heard in Washington, DC through compelling, authentic narratives, and engages policymakers, artists, and wider audiences in forums that cast critical issues in a new light. As a signature joint-initiative between the School of Foreign Service and the Georgetown College, The Lab is passionate about helping to train the next generation of innovators to use their artistry and voices to shape new understandings and to humanize others in pursuit of a better, more just world. In Spring 2019, The Lab is launching CrossCurrents, a DC-wide biennial festival, that will feature dynamic, socially-engaged performances from around the world and will catalyze conversations around critical topics like the global refugee crisis, climate change, and the rise of hate and polarization. For more information, please visit: GlobalLab.Georgetown.edu or @TheLabGU. Theatre Communications Group (TCG) exists to strengthen, nurture, and promote professional theatre in the U.S. and globally. Since its founding in 1961, TCG’s constituency has grown from a handful of groundbreaking theatres to over 700 Member Theatres and affiliate organizations and nearly 10,000 Individual Members. Through its Core Values of Activism, Artistry, Diversity, and Global Citizenship, TCG advances a better world for theatre and a better world because of theatre. TCG offers its members networking and knowledge-building opportunities through research, communications, and events, including the annual TCG National Conference, one of the largest nationwide gatherings of theatre people; awards grants and scholarships, approximately $2 million per year, to theatre companies and individual artists; advocates on the federal level; and through the Global Theater Initiative, TCG's partnership with the Laboratory for Global Performance and Politics, serves as the U.S. Center of the International Theatre Institute. TCG is North America’s largest independent trade publisher of dramatic literature, with 16 Pulitzer Prizes for Drama on the TCG booklist. It also publishes the award-winning American Theatre magazine and ARTSEARCH®, the essential source for a career in the arts. In all of its endeavors, TCG seeks to increase the organizational efficiency of its Member Theatres, cultivate and celebrate the artistic talent and achievements of the field, and promote a larger public understanding of, and appreciation for, the theatre.www.tcg.org.